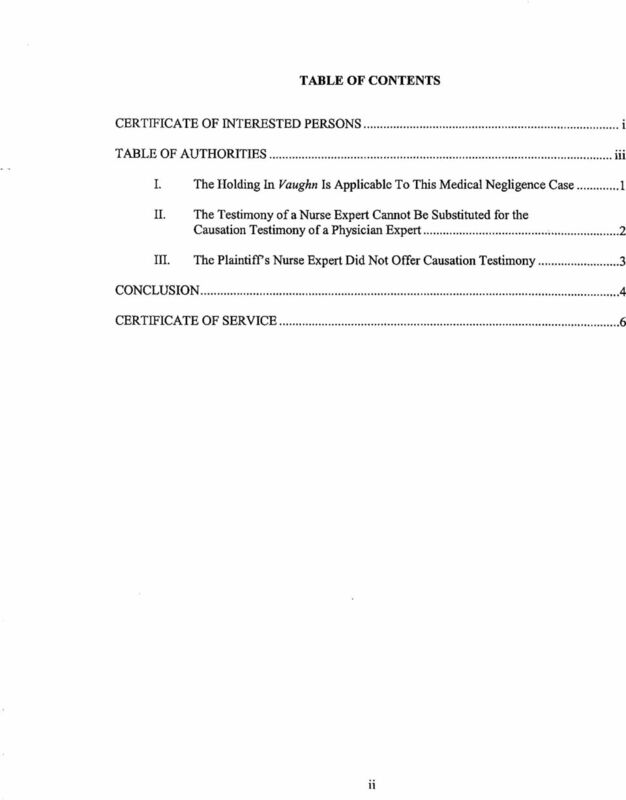 Download "COURT OF APPEALS OF THE STATE OF MISSISSIPPI"
E-Filed Document May 19 2014 15:36:57 2013-IA-00181-SCT Pages: 10 IN THE SUPREME COURT OF MISSISSIPPI CASE NO. No. 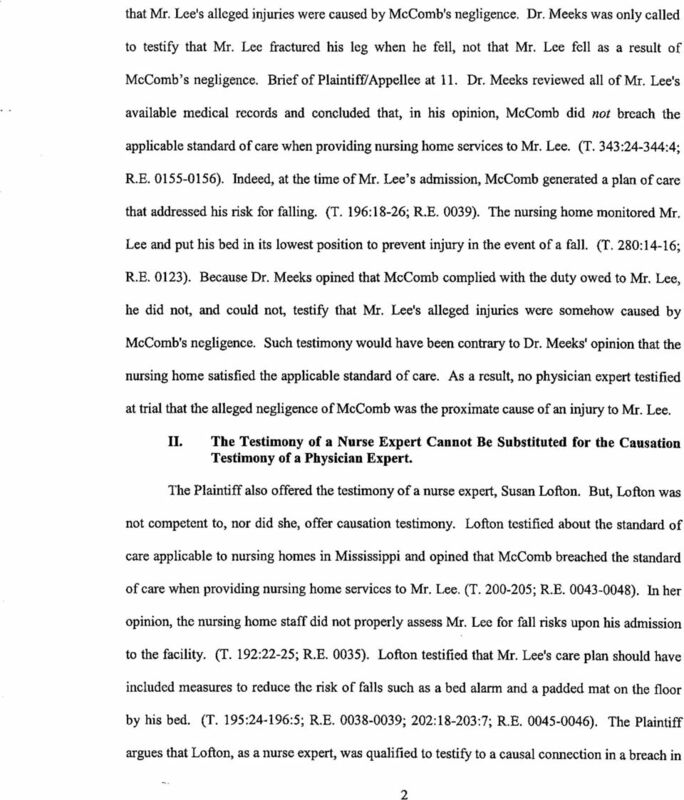 2013-IA-00181 VICKSBURG HEALTHCARE, LLC d/b/a RIVER REGION HEALTH SYSTEM APPELLANT VS. IN THE SUPREME COURT OF MISSISSIPPI NO. 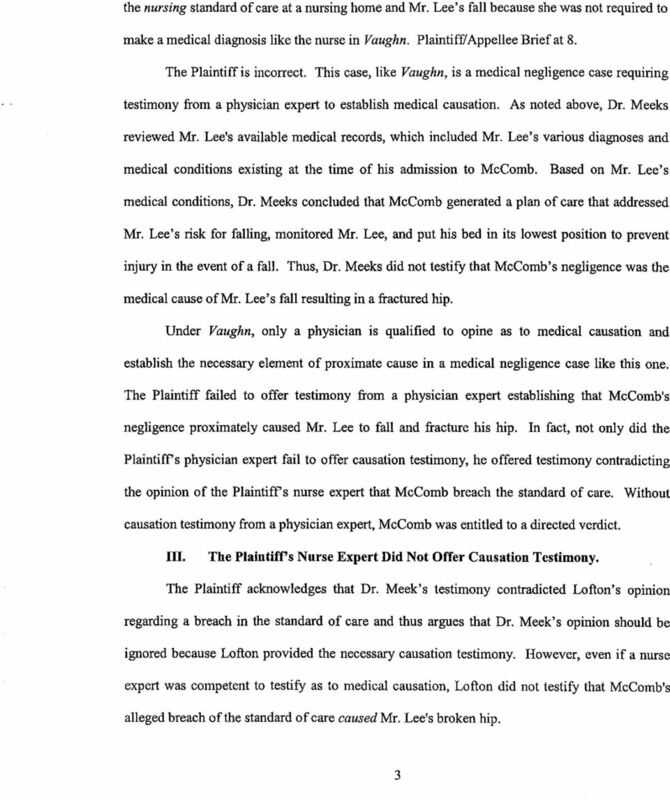 2013-IA-00181-SCT VICKSBURG HEALTHCARE, LLC d/b/a RIVER REGION HEALTH SYSTEM v. CLARA DEES DATE OF JUDGMENT: 01/22/2013 TRIAL JUDGE: HON. 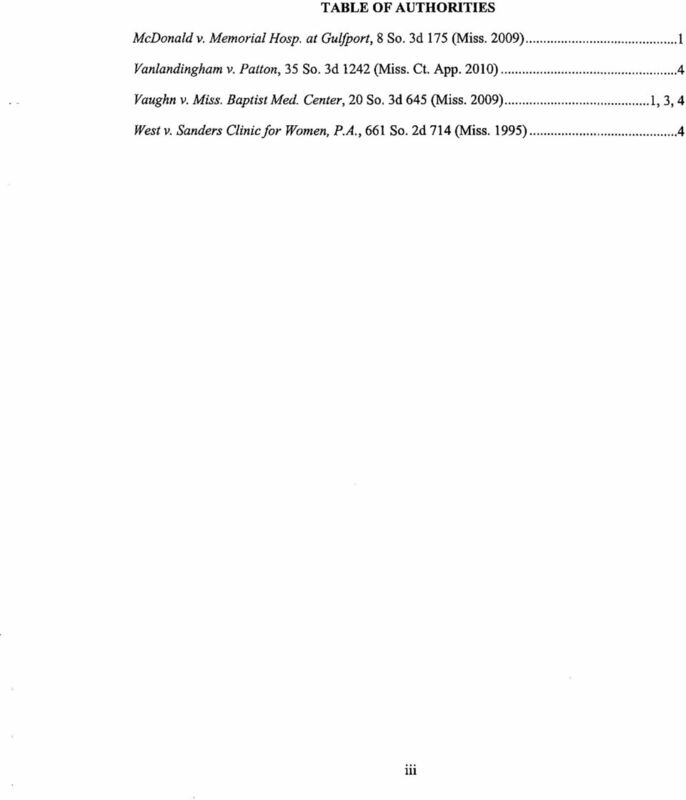 ISADORE W. PATRICK, JR.
[Cite as Bernardini v. Fedor, 2013-Ohio-4633.] 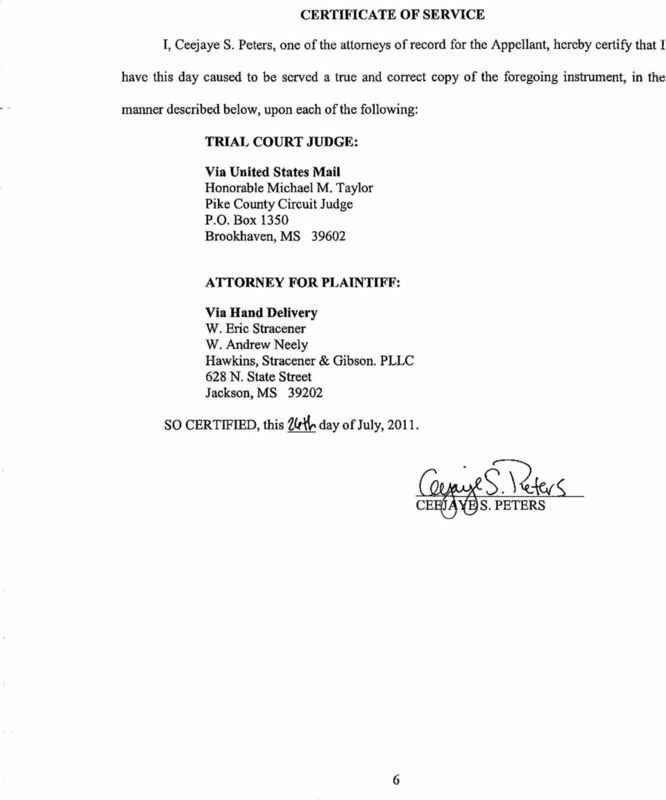 STATE OF OHIO ) IN THE COURT OF APPEALS )ss: NINTH JUDICIAL DISTRICT COUNTY OF WAYNE ) ROBERT BERNARDINI Appellant C.A. No. 12CA0063 v. ROBERT FEDOR, ESQ. BRIEF OF APPELLANT. 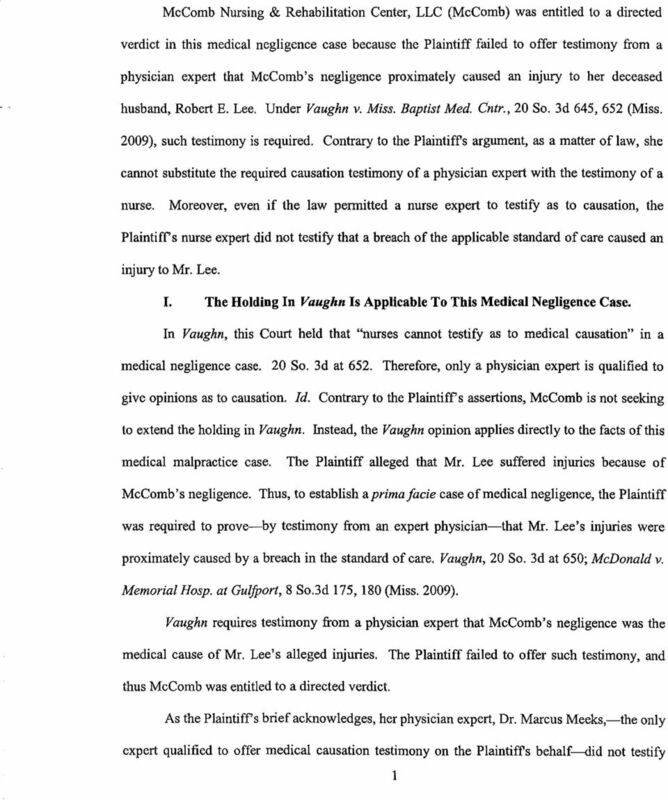 IN THE SUPREME COURT OF MISSISSIPPI CASE NO. No. 2013-IA-00181. 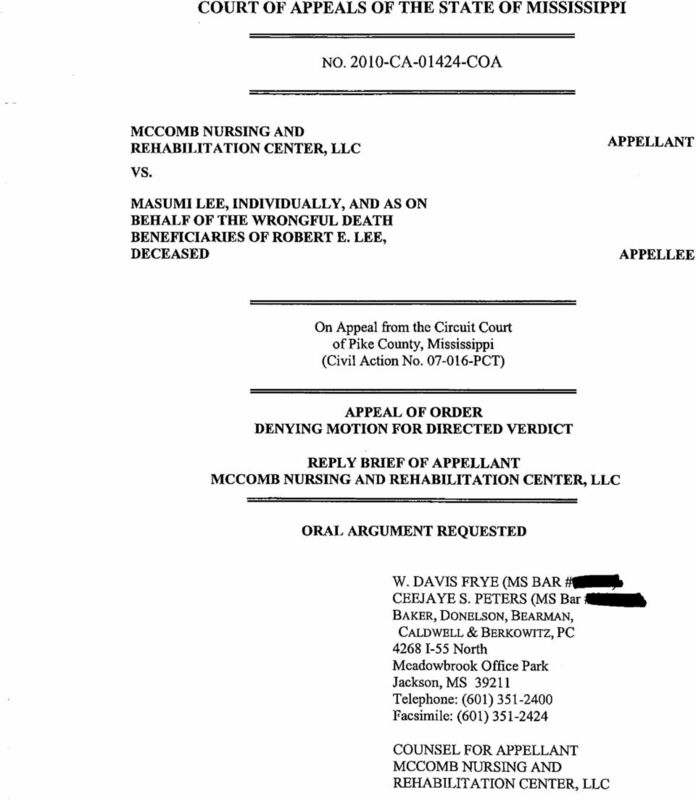 VICKSBURG HEALTHCARE, LLC d/b/a RIVER REGION HEALTH SYSTEM VS. IN THE COURT OF APPEALS OF THE STATE OF MISSISSIPPI NO. 2005-CA-00159-COA KIRSTEN JOHNSON AND JOHN JOHNSON JANIS E. BURNS-TUTOR, M.D. IN THE COURT OF APPEALS OF THE STATE OF MISSISSIPPI NO. 2005-CA-00159-COA KIRSTEN JOHNSON AND JOHN JOHNSON APPELLANTS v. JANIS E. BURNS-TUTOR, M.D. APPELLEE DATE OF JUDGMENT: 1/14/2005 TRIAL JUDGE: HON. 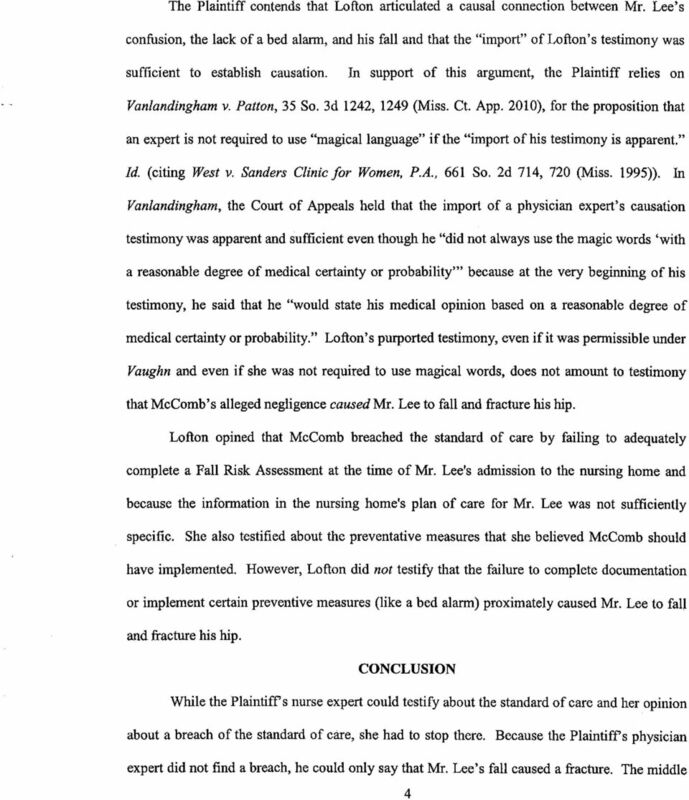 SUPREME COURT OF MISSISSIPPI CASE # 2008-CA-00781 SHANNON LEWIS AND JANA LEWIS, Individually, and on Behalf of the Wrongful Death Beneficiaries of Minor WILLIAM ROBERTSON LEWIS, Deceased; AND CALVIN E.
This opinion will be unpublished and may not be cited except as provided by Minn. Stat. 480A.08, subd. 3 (2010). STATE OF MINNESOTA IN COURT OF APPEALS A11-591 Johnny L. Moore, et al., Appellants, vs.
Illinois Association of Defense Trial Counsel Springfield, Illinois www.iadtc.org 800-232-0169 IDC Quarterly Volume 24, Number 1 (24.1.62) Health Law Update By: Roger R. Clayton, Mark D. Hansen, and J. 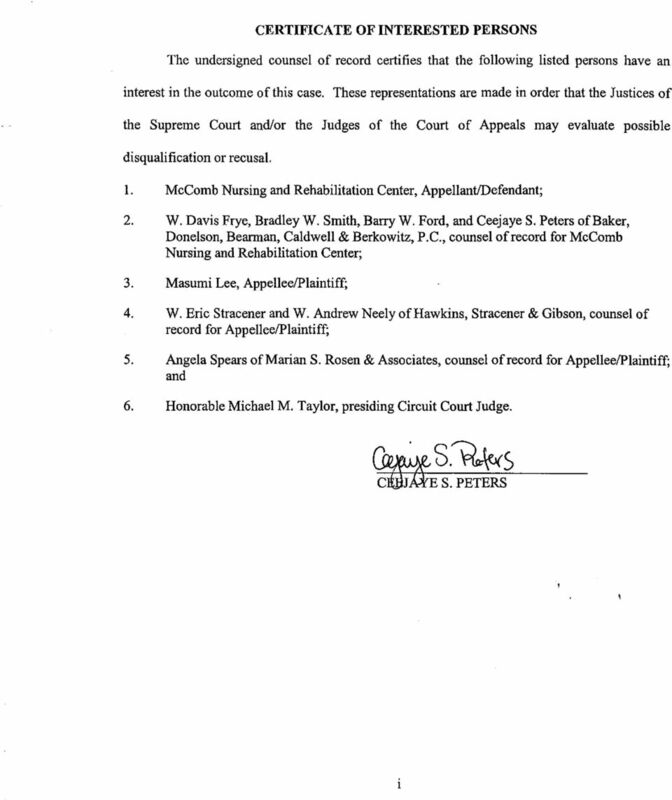 IN THE COURT OF APPEALS OF TENNESSEE AT NASHVILLE August 21, 2012 Session AMANDA SMITH v. WILLIAM R. WALKER ET AL. 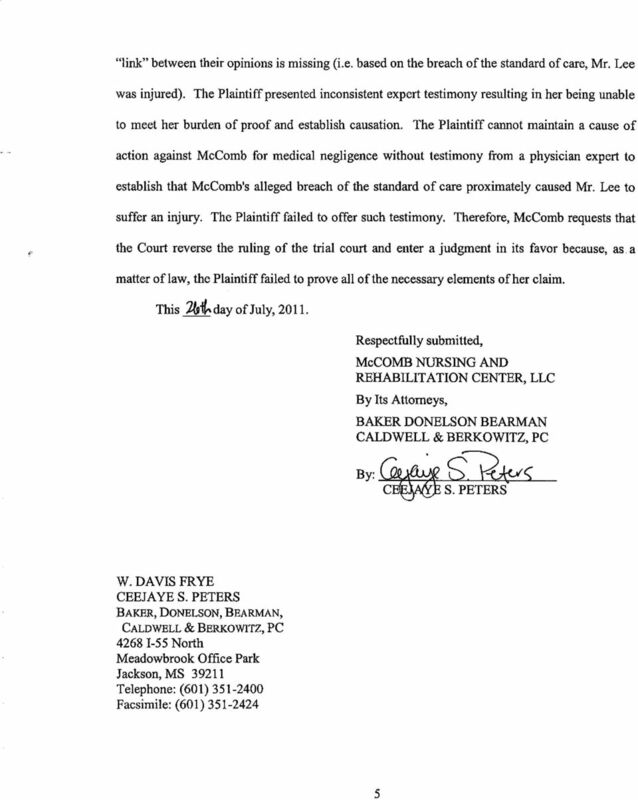 Appeal from the Circuit Court for Moore County No. 930 Franklin Lee Russell, Judge No. CASE NO. 1D09-0765. Rhonda B. Boggess of Taylor, Day, Currie, Boyd & Johnson, Jacksonville, for Appellant.